This week we finished a project we have been working on for a little while. 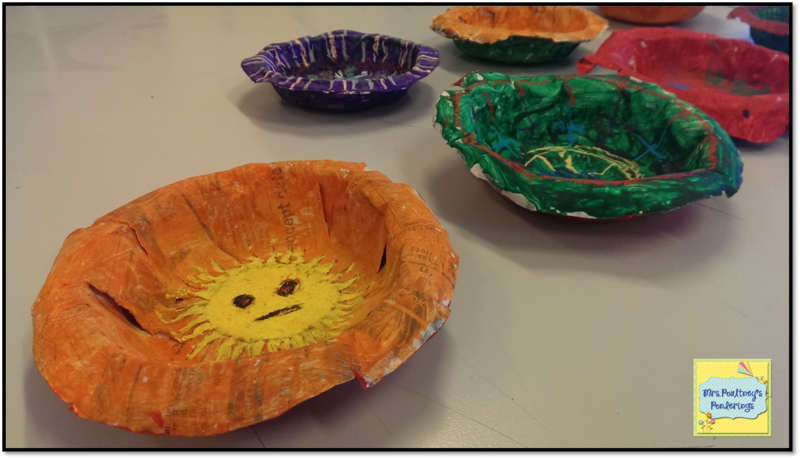 We made these beautiful papier mache bowls, I love the colors and the patterns they have created! I haven't got any progressive pics as it was a very hands on, messy process and my hands were right in there with them, not camera friendly hands. We had to make sure it had about 4 layers of papier mache on and let them dry. Once dry we trimmed the edges and painted the outside and inside of the bowl with a layer of white paint, letting each side dry in between. If you are using a lighter color like the orange pictured above you might need a couple of white paint layers to hide the newsprint if you want, (learn from my mistake). We then painted the colored paint over the top. 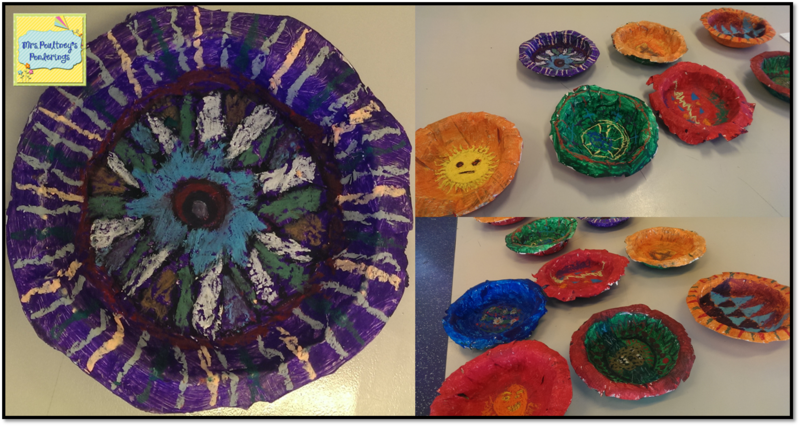 We used the plastic bowls to put the paper bowls in whilst painting to help it keep its shape while the paint was wet. 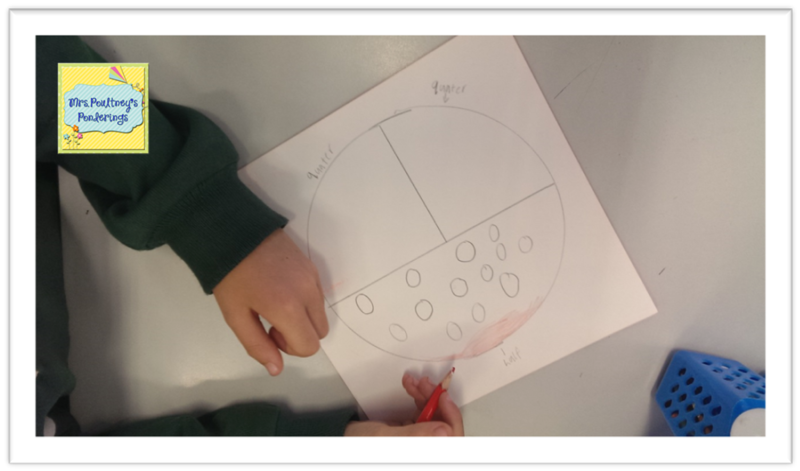 The kiddos then used oil pastels to draw their patterns on, we were focussed on our patterns having a South American flavour to them. Finally I gave the bowls a spray with a fixative to seal it. I hope you love these and can take a few ideas for papier mache from this. 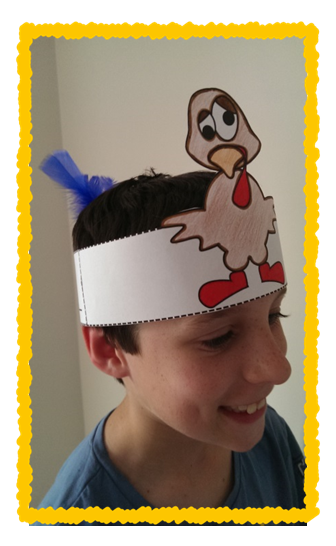 Do your students love to make crowns or headbands? Who doesn't love headwear! I have finished up this fun and easy to use No Prep file. 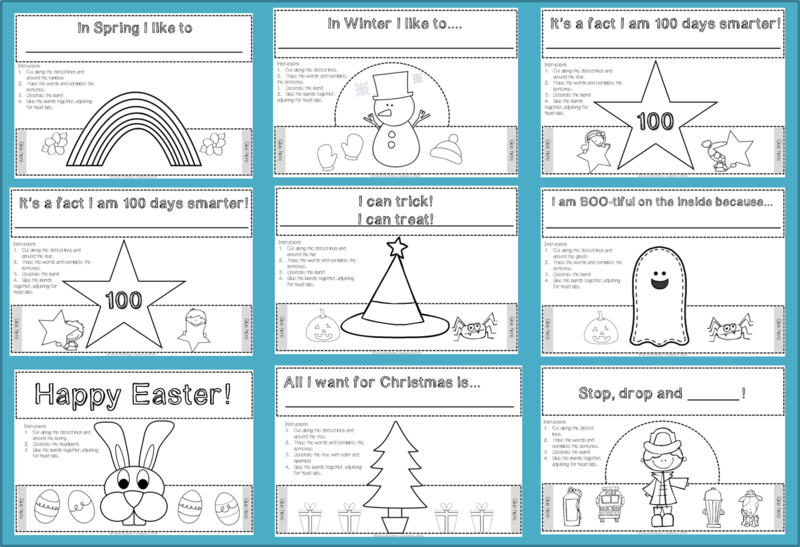 These would be great for centers or just as a fun way to celebrate special days and seasons. 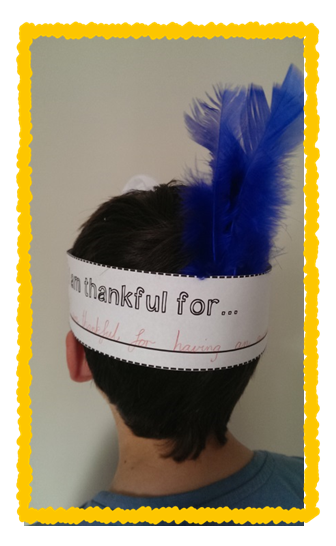 Each headband has a message on the back band for students to complete. I will be adding more to this pack as the year goes on, so jump in now to get the updates for free! Just click on any of the pics to get your copy and if you have a special request email me and I will be happy to help you out! Yay! Time for Happy Snaps with Shanyn @Classroom Chit Chat! Here are a couple of things that made me smile this week. Office Works!! I love shopping at Office Works! 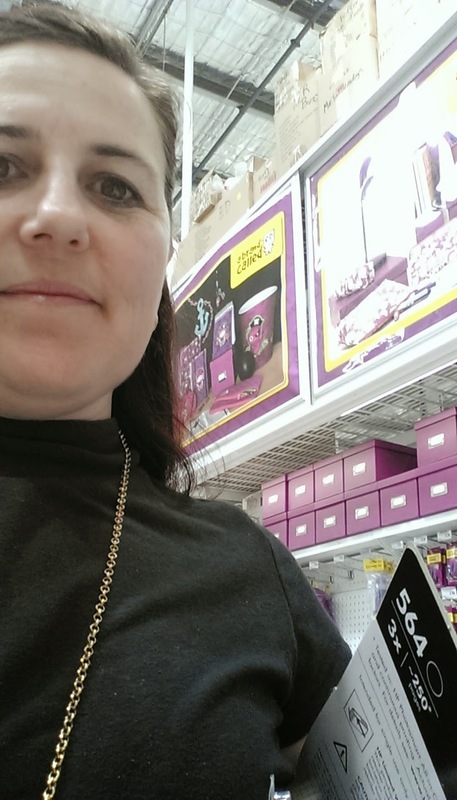 This is one of those places where you go in for printer ink and come out with a wireless mouse (because you need it! ), chunky markers (I have just the kiddo who needs this! ), craft scissors (I definitely need these for Christmas craft).....are you noticing a pattern here? 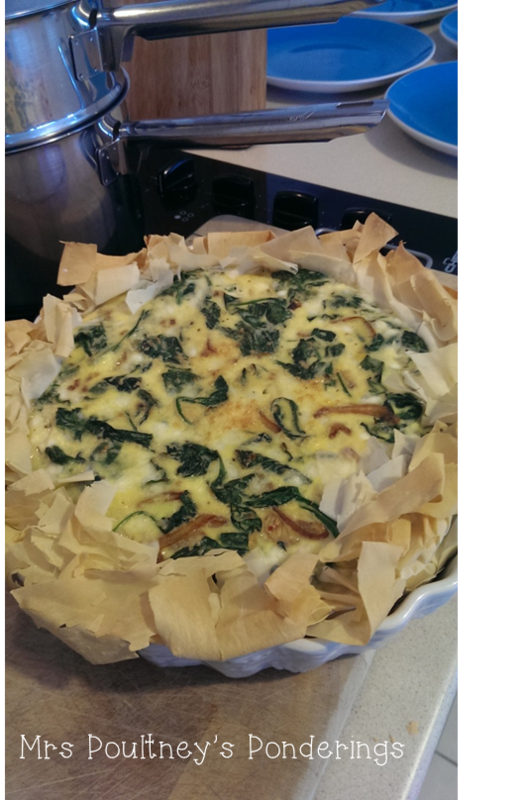 I posted this on my Instagram, it is a spinach and caramelised onion tart with filo pastry. 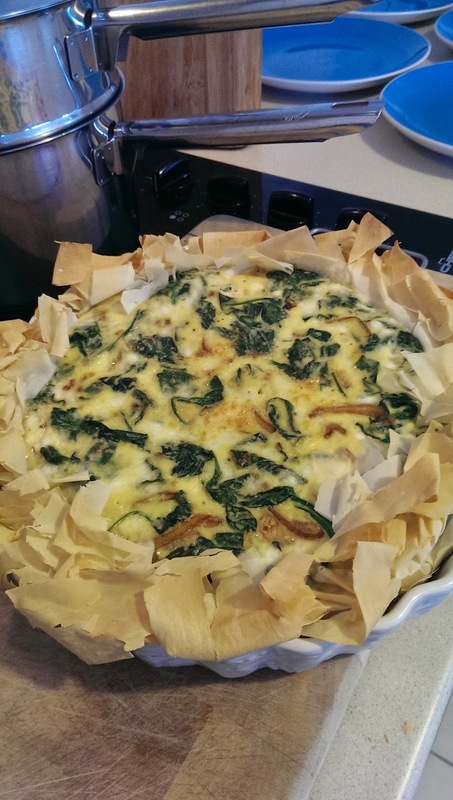 Lordy it was delicious! Here is something you need to know, it is low, low calorie, seriously! I was so happy that I could have some for lunch the next day. Word of warning though......it has onions and eggs......the aftermath was somewhat.....gassy interesting. Hairdresser hair! I luuurve going to the hairdresser, there is something so lovely about someone washing your hair and making you feel like you are the center of attention for a couple of hours. I got a new darker color as well, friends I have to tell you I got a little freaked out a couple of weeks ago when I found my FIRST grey hair! I made the hairdresser have a really indepth look to see if there were anymore, there weren't. Phew! I am taking it as an anomaly and I am sure it will never happen again! I hope you had something to smile about this week, if you did head over to link up with Shanyn! 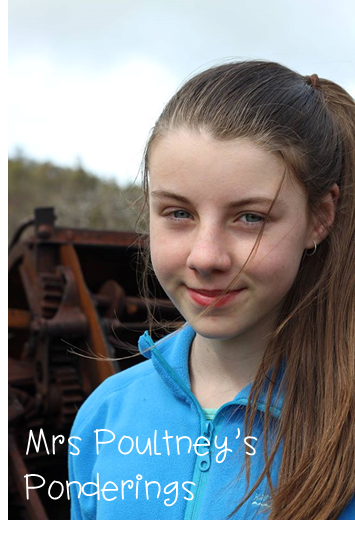 So I have had a few discussions of late with many other teacher bloggers, about this new social media platform called Tsu (say Sue) and have started up a Mrs Poultney's Ponderings page to share ideas, tips, and lots of fun with my followers. You may ask how is this different to Facebook or other social media sites? For one we own the content and so our followers get to see ALL of our posts not just one's based on an algorithm or likes or the amount of comments on a post. I can tell you that for many people who have a page this is quite a frustrating thing particularly when having giveaways or freebies going out to our fans. This is very appealing to me both as a poster and a follower. You have to be invited by a user to register so if you want to sign up to follow some amazing teacher bloggers. If you want to sign up here is my link http://www.tsu.co/mrspoultney. This helps to build your following as well as revenue for sharing. You can choose privacy settings as public or friends only and decide to follow or friend someone. There is already a community of teachers there now all with interesting posts about their classroom and experiences. 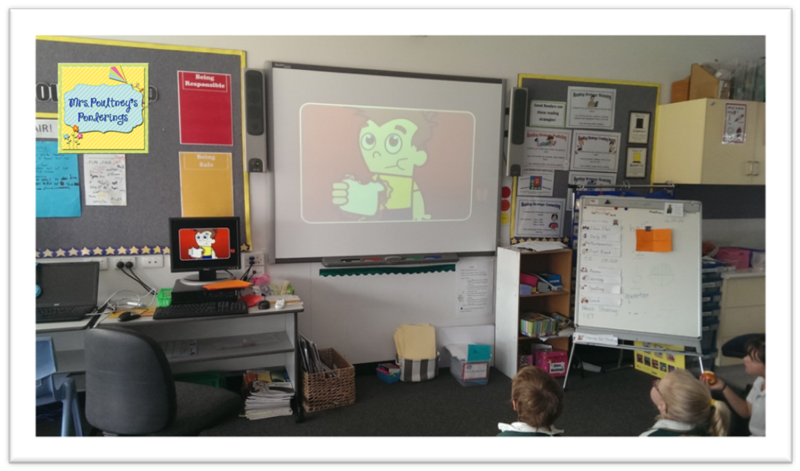 If you are looking for more information Blair at One Lesson at a Time has written a very comprehensive blog post about it which you can read here! 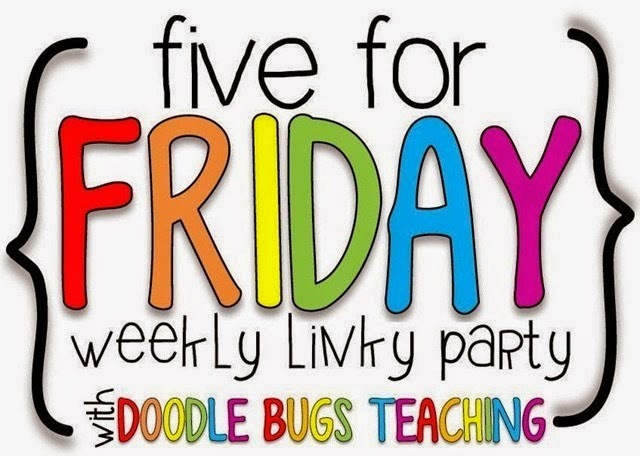 I totally had this post started last night and then......then I didn't finish it because there was a couch,TV a blanket (yes it is still chilly here) and wine.....post not finished :) but I am back to link up with Doodlebugs! 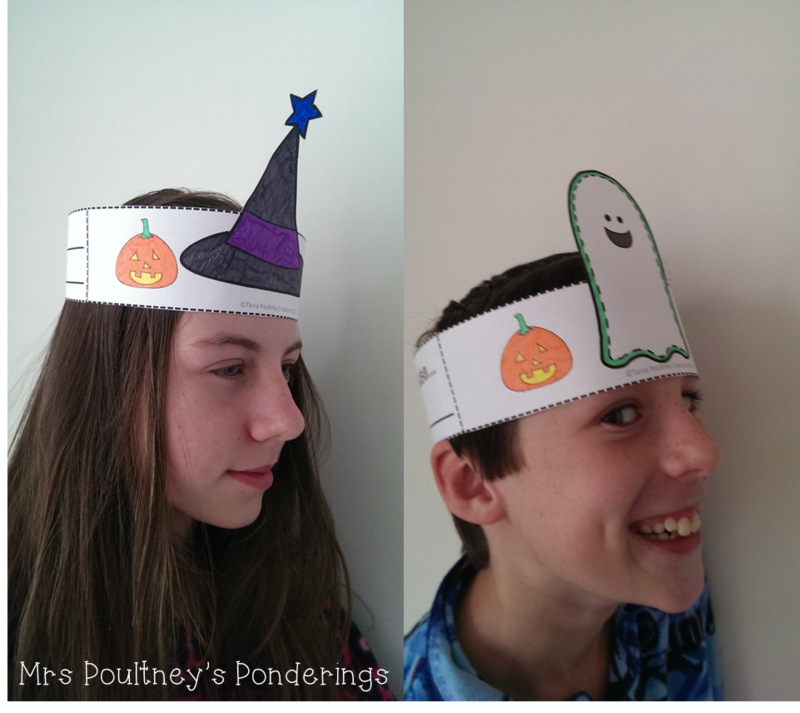 I totally made my kiddos model my newest product Halloween headbands....they were so into it, can't you tell! Seriously they had a blast coloring them in and writing a halloween message on the back. Halloween is not as much of a big deal here in Australia but these two have begged me to let them dress up and trick or treat this year.....so I said yes! That makes me Mother of the Year! 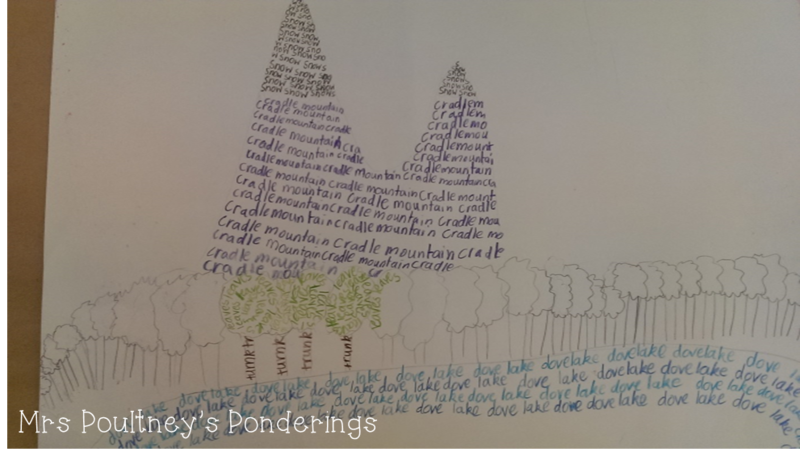 My Year 4's have been doing some word art and I am loving how they are turning out. 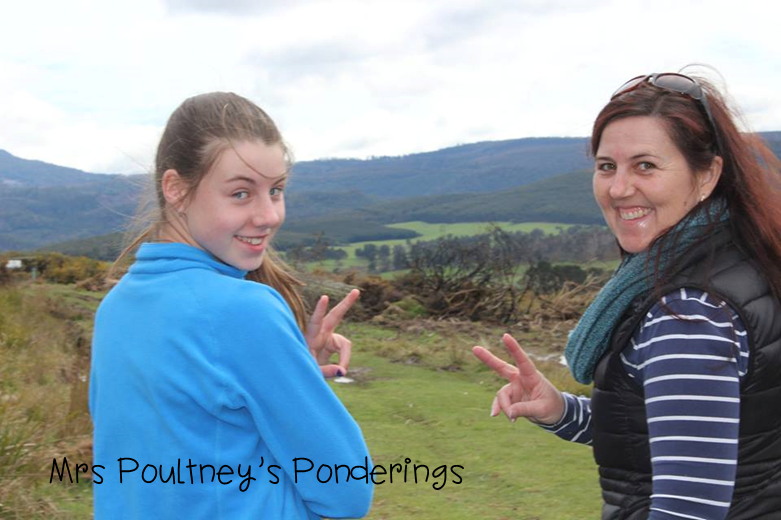 They were asked to choose a landscape that they love going to withing Tasmania, this one is Cradle Mountain in the background and Dove Lake in the foreground. Hikers paradise! My Year 2's have finally finishing their Spring trees! Friends we started this BEFORE our Term 3 break, that was over 4 weeks ago. Well, I said, enough dilly dallying around let's get these bad boys finished! So we did. 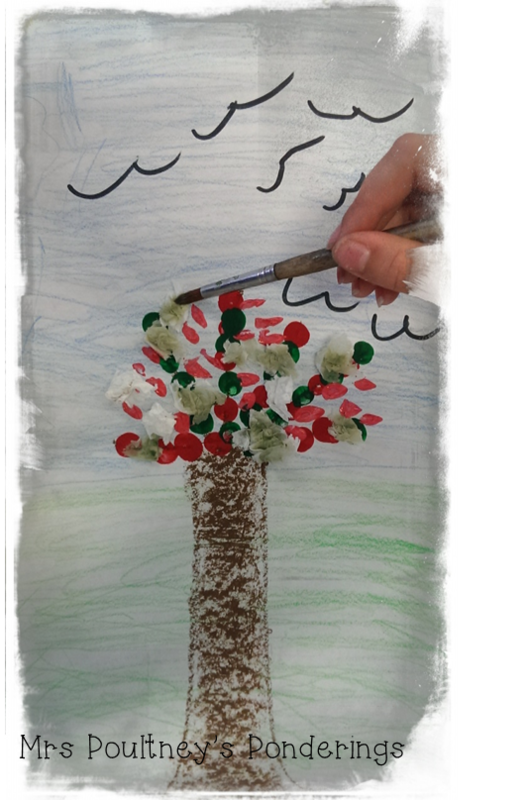 We used pencils and crayons for the background and trunk then used white tissue paper to scrunch and paint with watercolor for the leaves, the kiddos loved watching the watercolor spread through the paper. The blossoms were made by dipping cotton tips into paint and splodging (technical art term) onto the branches. I love them! 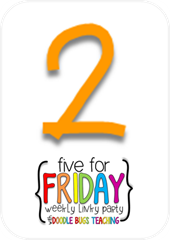 We had a short week at school this week, with public holiday on Thursday and A Student Free Day on Friday that was full of PD.....oh the humanity! Some of it was great, some of it was not, I'm sure you know those presenters that could possibly be a reanimated cadaver? Yup, we had one of them. 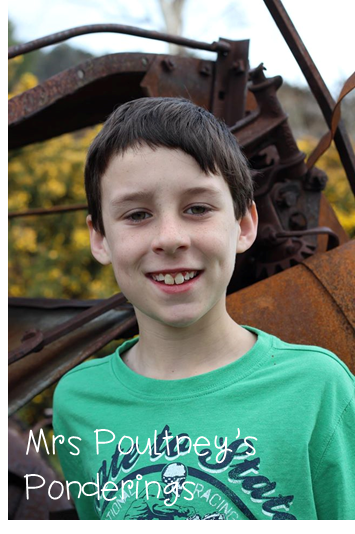 I am joining Shanyn over at Classroom ChitChat to link up with her Happy Snaps linky! Here are a couple of pics that have made me smile this week. 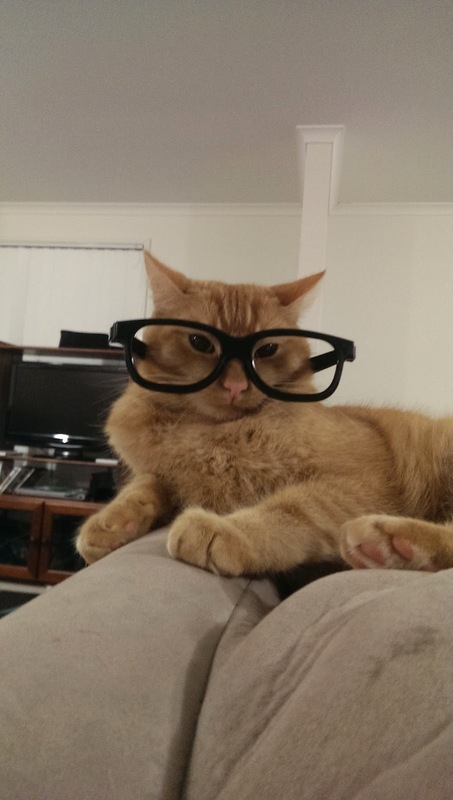 This is our cat Jaspurr, but my hubs calls him Mr Meowgi. He is only 2 years old and we love, love, love him. He likes to sleep behind your legs and generally stays there all night. He thinks he is a dog and has been trying to get into the backyard to play with our dogs.......they think he is an entree, he thinks he is one of them. I think it is easy to say if he ever gets out there, it won't be pretty. Well that is just a couple of snaps that made me feel happy this week! 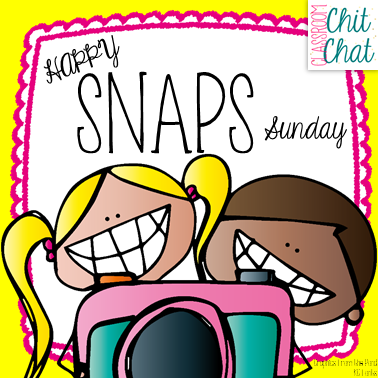 Why not head over and link up with your happy snaps! This is a quick post to show you what I have been working on during this rainy afternoon. This one is made just for my friends who celebrate Thanksgiving! Just click on the pic above to get your copy. It's that time again! Time for another Bright Idea! 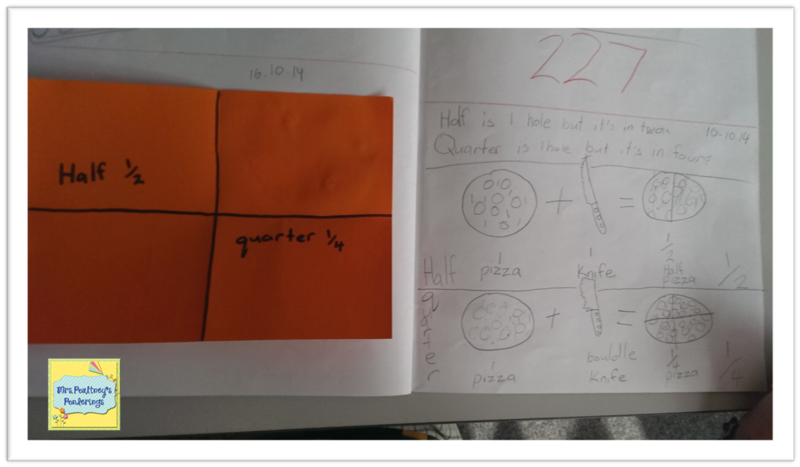 This month I want to share a couple of ideas on teaching fractions in the early years. 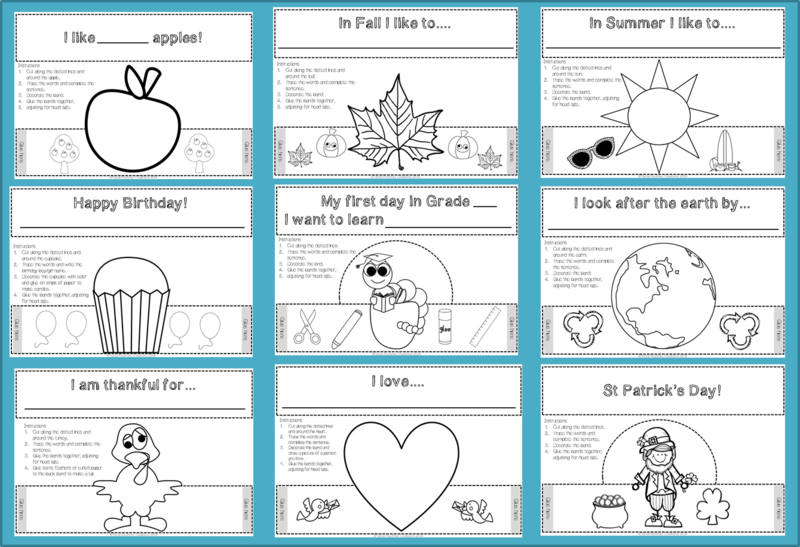 Then I give each child a piece of paper and ask them to fold it in half, we draw a line and then label one half. We then fold it into quarters and label it again. For higher grades we keep going up to 16ths. 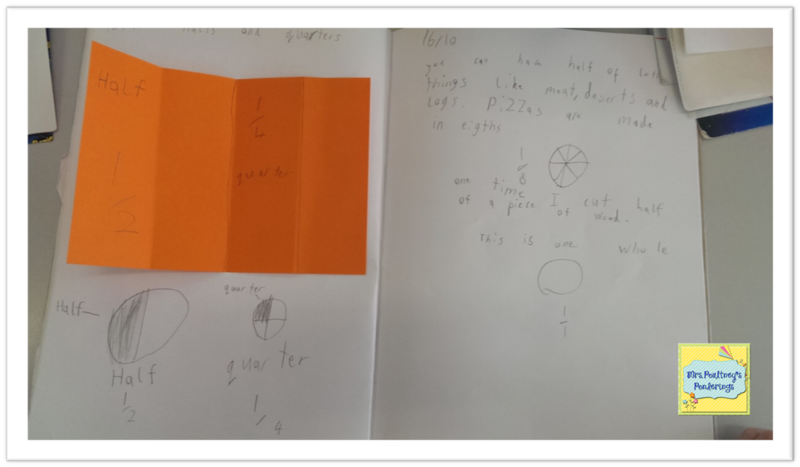 I then asked the kidddos to write down what they now know about fractions, this is a great sharing activity. 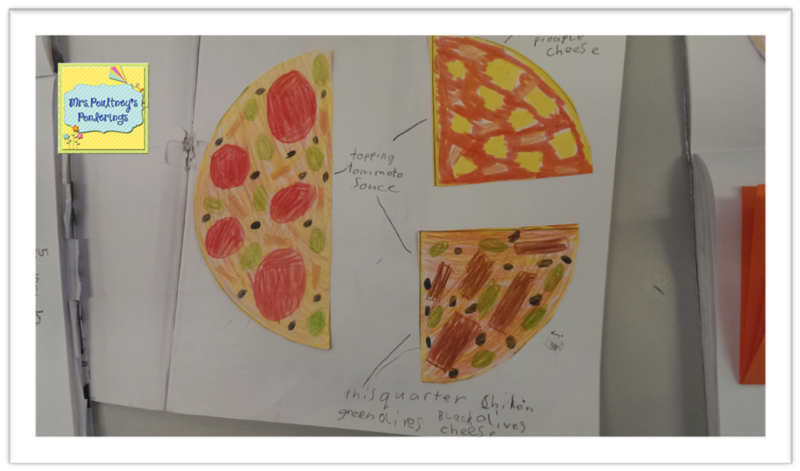 The students divide their pizza into the fractions, then add the topping to the correct fraction. 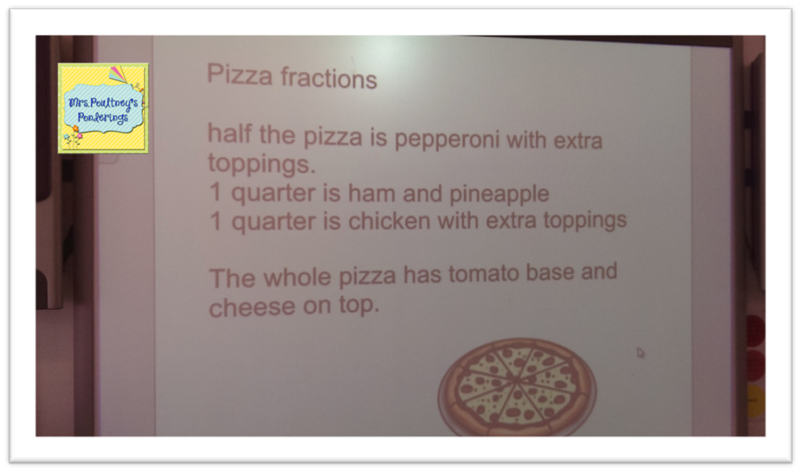 Each student then labelled their fraction pizza with the toppings they had included. 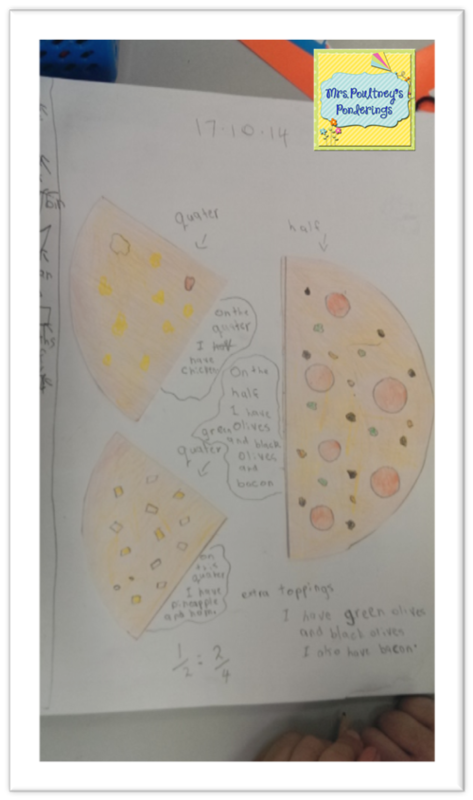 I tell you there are some budding chefs in my class this year! I hope you enjoyed this Bright Idea on our fractions activity. 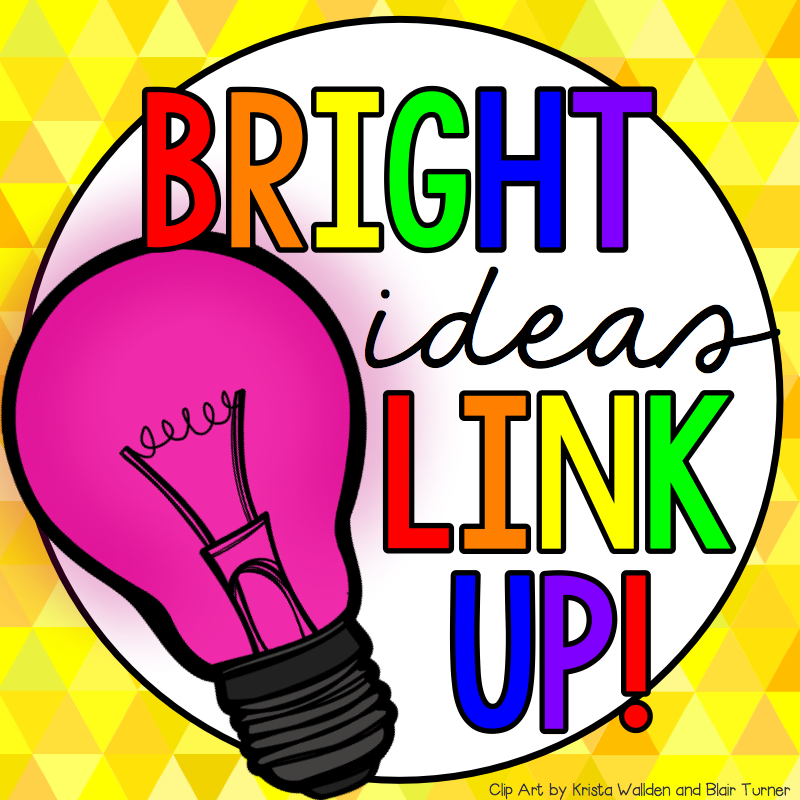 You can find some other amazing Bright Ideas right now by clicking on the linky below! Enjoy! 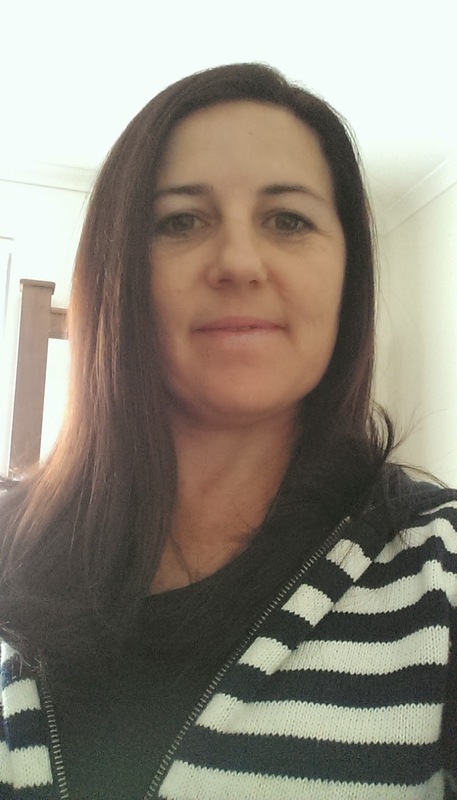 I am linking up with my beautiful blogging buddy Shanyn at Classroom Chit Chat. She has started a weekly linky to share photos from your week that made you smile or makes you happy and I couldn't think of a person who makes me smile more than Shanyn. 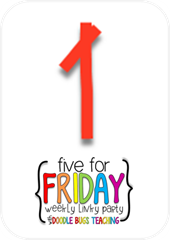 I have already shared some pics today in my Five for Friday post but so glad I get to share some more with you! These two gorgeous babies make me laugh every day. My beautiful daughter is one of the most talented piano players I know and always has a kind word, she is a gentle soul and cares more for those around her than herself. Mr cheeky monkey is bound to be a comedian. He has us in stitches ALL the time! He is such a curious boy and always asks questions, these are often pretty random. His latest one was, "Mum do snails blink?" If you ever need a cuddle, he is the one to go to. This man is my rock and I am super duper proud of him! He is my hero and serves his country everyday. In just a couple of weeks we will have been married 17 years, whew that is a loooonng time. During that time we have moved around the country and I guess because of that we have learned to rely pretty heavily on each other. He is my best friend. This pic right here is my blogging family, I love these gals like they were my sisters. Make sure you head over to Shanyn's blog by clicking on the button above to link up your happy snaps! 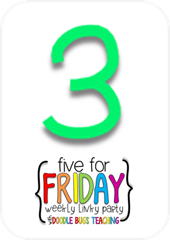 I am late linking up for Doodlebugs Five for Friday linky, so this will be a Five for Frunday! I have a good excuse, I have been away, far, far away where there is no internet or mobile phone connection, so really there was no way I could link up in time! We are on the last week of our school holidays and we spent a few days up at our block. 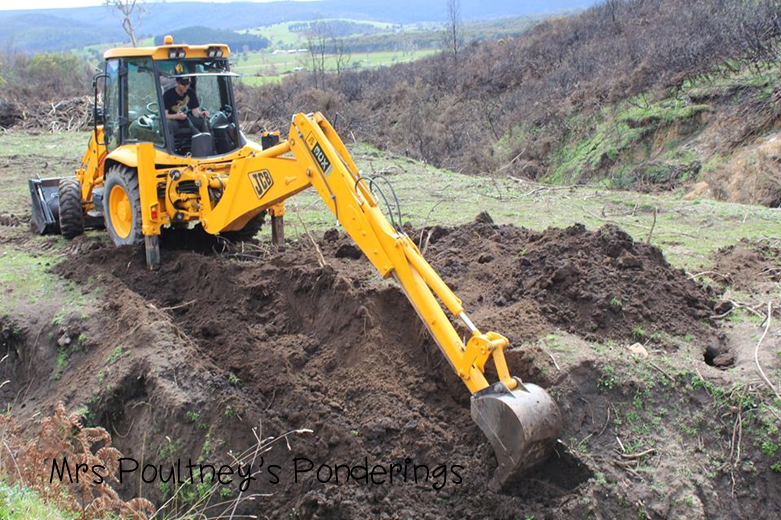 This is a long term project and includes lots of clearing, dam repair and setting up a caravan. We have a creek that runs along the front of our dam and is eroding the dam face so we have started to divert the creek and then we will begin to repair the damaged face of the dam. We are hoping to get this done in the next couple of weeks as their has been a lot of rain and the creek is flowing quite fast. These 2 light up my life everyday :) They love getting out into the bush, climbing trees and playing in the mud. 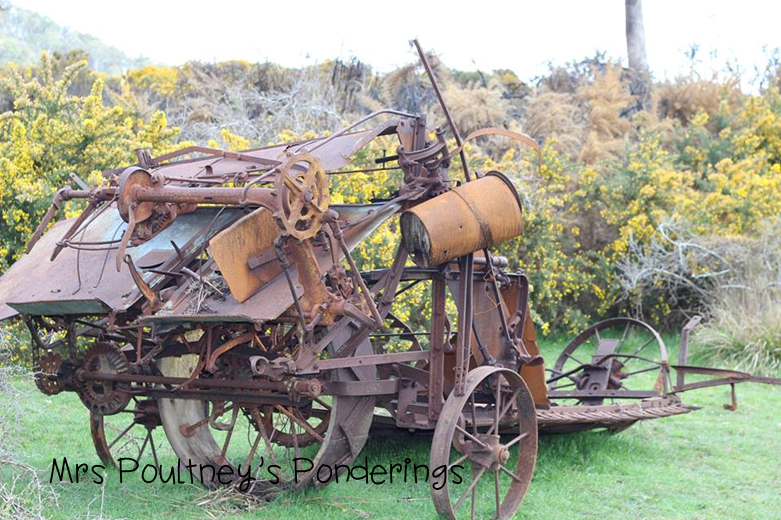 We have lots of old machinery that we have found hiding in the gorse when we have cleared it. Gorse is an introduced species to Tasmania and was used as windbreaks and fencing. It is a prickly, horrible bush that is taking over the land and native species are crowded out, we have many, many acres to clear and it is very hard to kill. 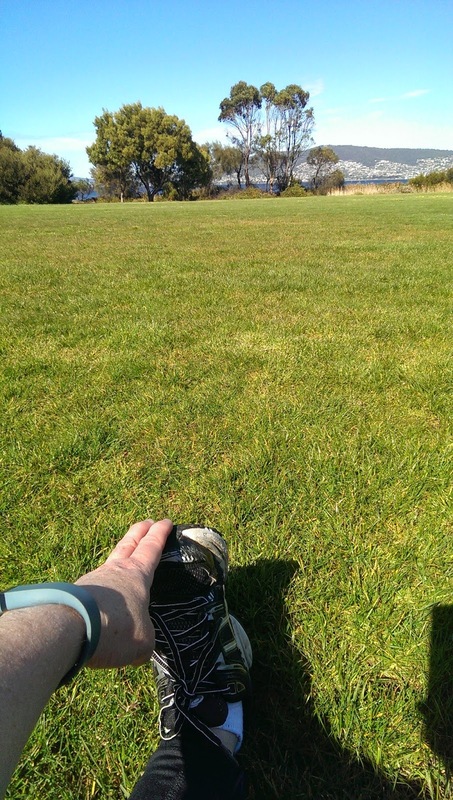 You can see the gorse in the background of this pic, it is covered in yellow flowers in the Spring. We will be using this one next week when I head back to school. 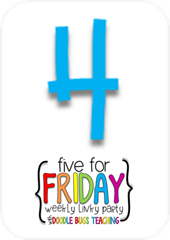 Head over to catch up on some more Five for Friday Frunday fun!